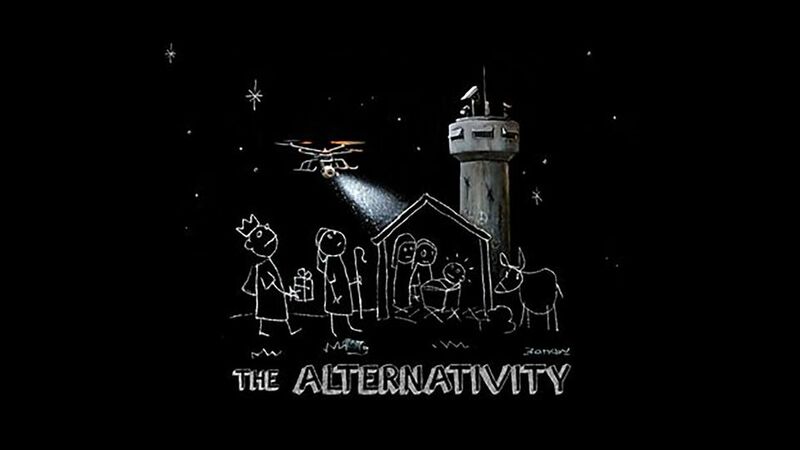 In a bid to bring some festive cheer to what Banksy calls “the least Christmassy place on earth”, the British street artist has teamed up with the Oscar-winning film director Danny Boyle to stage an alternative nativity play at the artist’s Bethlehem hotel. The Alternativity took place on 3 December in the carpark of the Walled Off Hotel, just around the corner from Manger Square, which is believed by some to be the birthplace of Christ. The play, which features local children singing Jingle Bells under a flurry of fake snow, was filmed for a BBC Two documentary to be aired on Sunday, 17 December. The documentary follows Boyle over the course of six weeks as he tries to assemble a crew and cast, including a donkey, for the show. During the film, Boyle describes how he accepted the unorthodox request from the elusive Banksy–a man he has never met–and admits the closest he has ever been to the Middle East is a fortnight in Majorca. Patrick Holland, BBC Two’s controller, describes The Alternativity as “a challenging and provocative exploration of a story that speaks to young and old alike”. Banksy has been outspoken about Britain’s role in establishing a Jewish homeland in Palestine 100 years ago. To mark the anniversary on 2 November, he offered a royal “apology” engraved on Israel’s barrier in the occupied West Bank. The artist also invited 50 Palestinian children to a tea party. During his latest visit to film the documentary, the artist created two new murals. Peace On Earth is a text-based work stencilled on a wall in front of the Chapel of the Milk Grotto, which has the asterisked caveat: “Terms and conditions apply”. The second work shows two angels trying to crowbar open the West Bank wall. Banksy launched the Walled Off Hotel in the shadow of the separation barrier in March 2017 with the aim of attracting a different sort of tourist to the area and providing much needed local jobs.